While I’m always excited to see the little bubble pop up on my blog indicating I have a new comment, today was exceptional! 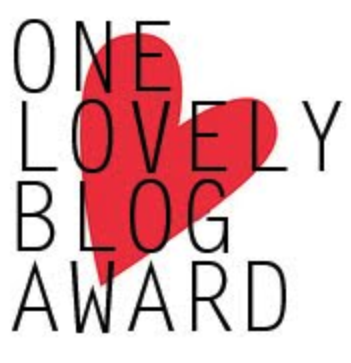 I was nominated for the One Lovely Blog Award by Green Lizard’s Blog! Thank you very much, you’ve made my day! And I enjoyed hearing your fun and quirky facts about yourself as much as I enjoy your blog! Can I tell you how nice it is to hear that what I do is noticed by another? And how wonderful it is to send that message forward to those who’ve I’ve found have touched me in some way with what they share. 1. Thank and follow the person who has nominated you. Provide a link to his/her blog. 2. List the rules and display the award pic. 4. Nominate some other bloggers and let them know that they have been nominated. 1. If I had more money, it’s possible that I could be considered to be “eccentric.” As it stands, you’ll have to make your own judgement. 2. I sometimes don’t wear “deoderant” as discussed here! 5. I was a vegetarian for years until my Mom, who never “got it” tempted me back with a filet mignon from our local hometown butcher (who raises their own beef) on a visit in 1984. 6. I’m obsessed with birds and have many feeders. I’m obsessed with the neighbor’s cat, who I have seen making off with a bird. Now I only feed in the winter when the cat is kept indoors. 7. My dog has his own Youtube channel (I don’t, but maybe in the future!) and his own facebook that documents some of his training and activities. He is now trained Service Dog and accompanies me everywhere. My cat is jealous. This prolific blogger has a ton of practical advice and recipes and puts it all out in a straight forward manner. You never know what he’ll come up with next. I’ve been following him for years, but hadn’t realized his posts weren’t coming up, so thinking about his blog made me go back and push the button! Maisa is a Brazilian transplanted to Canada, and I felt like I made a discovery when I happened across her blog recently. The girl cooks, and her stories will make you smile, laugh and feel sentimental. Make sure to read her take on Williams-Sonoma’s most ridiculous kitchen gadgets. I wish I could go on and on, heck, I wish I could just post my “following” list! Hope you enjoy visiting them! Lol! I guess I kicked it off, because this week the Nobel Prize was awarded: http://www.bbc.com/news/health-29504761, then we’re on to the Emmys and the Grammys and who knows what else!! Thanks, Brendon! One of my very favorite readers pinned the name Ms. Frau on me, so feel free to use it! I fell in love with your blog – how cute are those “upcycled” Thai Pies. And the Black Tea Creme Caramel! I’m looking forward to hearing more from you…well maybe not about the bugs…that’s a little too Paleo for me! Cheers to you, right back CCU! And thanks! It’s fun to be recognized and more fun to pass it on. I just wish I could include everyone!